Combining traditional French culinary creations, exquisite décor and superior service, La Brasserie provides a refreshing dining experience at the heart of Antigua Slipway in English Harbour. 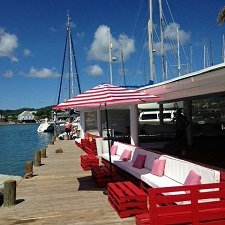 With the dock along the front of the restaurant, feel free to tie up or take a water taxi over and join us for a meal. Whether with friends, family or a loved one, it's the perfect place to relax and soak up the view of Nelson's Dockyard’s atmosphere while dining on traditional French fare. Or stop in to pick up a fresh baguette, a few croissants and order a meal to takeaway. La Brasserie serves breakfast, lunch and dinner along with entertainment on select evenings for your delight. Happy Hour with specials on drinks from 4:00 - 6:00 pm daily, plus a carefully chosen wine list available. La Brasserie also offers an additional catering service with delicious packaged lunches, a full meal ready to serve. Follow La Brasserie on Instagram and Facebook.